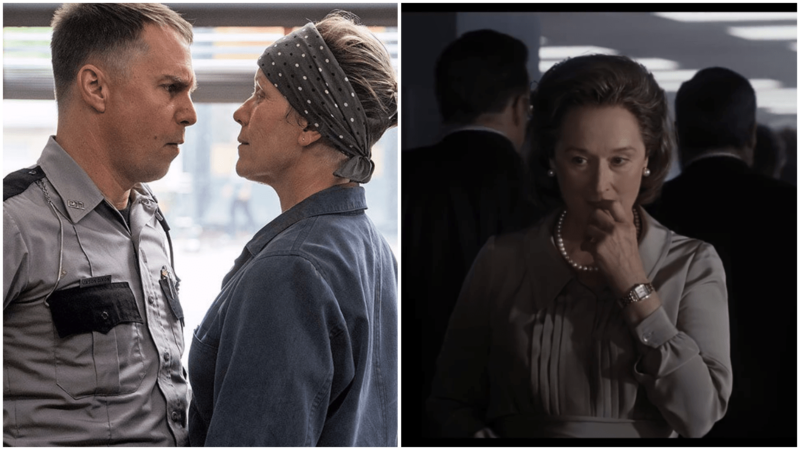 The nominations for the 24th Screen Actors Guild Awards are in and Three Billboards Outside Ebbing, Missouri came out on top with four mentions including Outstanding Performance by a Cast in a Motion Picture. Lady Bird was next with three: Cast, Female Actor (Saoirse Ronan) and Female Actor in a Supporting Role (Laurie Metcalf). Every film nominated for SAG’s top award this year also earned a nomination in another category; Holly Hunter in The Big Sick, Daniel Kaluuya in Get Out and Mary J. Blige in Mudbound. But most nominations today found themselves to be the only mentions for their films. Lead Actor alone has four slots of sole nominees. The Shape of Water surprisingly underperformed today. The film earned nominations for Sally Hawkins and Richard Jenkins but Octavia Spencer was missing and bigger, no Cast nomination. Call Me By Your Name, which was a longshot for a Cast nom, only earned a single one for Timothée Chalamet. No Hammer, no Stuhlbarg. Instead, it was Three Billboards that grabbed two supporting nominations – Woody Harrelson and Sam Rockwell. The Screen Actors Guild nominations always take a few left turns from the frontrunners and while we rely on this precursor to help inform our decisions (the SAG Cast nom for Best Picture is still a solid stat) we know that visibility and screeners are crucial for this group. Judi Dench (Victoria and Abdul) and Steve Carell (Battle of the Sexes) are probably hitting their high point here. Although we’ve seen some rubber-stamped nominees show up here, especially if they are an undeniable frontrunner, today was a perfect example of how a late-breaking film can falter. Both The Post and Phantom Thread wound up with zero nominations today. For Phantom Thread the only realistic nomination was Daniel Day-Lewis (who will probably end up Oscar-nominated anyway) but the bigger news is The Post missing everywhere. Streep, Hanks, the Cast award. So what does this mean moving forward to the Oscars? It means it’s going to be very, very hard for The Post and The Shape of Water to overcome the no Cast nom obstacle here. They’re also both December releases (another Oscar obstacle). Think La La Land last year. Sure, the films are very likely Oscar nominees but their chances at winning just plummeted. It also means that, statistically, our Best Picture Oscar winner is going to be Get Out, Lady Bird or Three Billboards Outside Ebbing, Missouri. Keep an eye out for updated Oscar predictions from the Gold Rush Gang soon. The winners will be revealed at the SAG Awards ceremony on Sunday, January 21, on TNT and TBS. Here is the full list of Screen Actors Guild nominations for motion pictures.